Former Colorado Secretary of State Scott Gessler identified nearly 5,000 noncitizens in Colorado who voted in the 2010 general election. Gessler’s office uncovered upwards of 12,000 noncitizens registered to vote. Liberal groups who oppose stronger election system protections attacked him for trying to verify citizenship status — because God forbid public officials sworn to uphold the rule of law actually do anything to enhance the integrity of our election system! But since making those claims, Gessler’s office said it has been able to identify only 80 non-citizens statewide who were on the voter rolls over the past nine elections, representing 0.0008 percent of the more than 10 million ballots that have been cast in those general elections, and those ballots don’t include primary races or local elections that were held during that time. A check by The Daily Sentinel with those district attorneys over the past two weeks, however, revealed that none of the referrals led to criminal prosecutions, though some still are under investigation. The analysis also showed that although some of the non-citizen voters did cast ballots in at least one election going as far back as 2004, the preponderance of the other voters actually were citizens who legally had the right to vote. Yet, despite Ashby’s readily-available piece, Malkin has written a column that’s basically premised on the 5,000-voting-noncitizens falsehood. If I were Malkin’s editors at Creators Syndicate, I’ll pull the piece. It can’t really be corrected adequately. Journalists should take note of the factual errors in Delta County Republicans’ explanations of how and why a racist meme appeared on the Facebook page of Delta GOP Chair Linda Sorenson. Some of the lapses are going unchecked in media coverage of the incident. Sorenson didn’t simply “like” the Chimp post; she shared it. As you can see on the right where it says “Linda Storm Sorenson shared…”, she affirmatively shared the chimp meme; she posted it to her profile, as GOP Chair Steve House explained to CBSDenver TV. Sorenson misquotes herself. “I admit to saying to the blogger that; ‘I don’t care if you’re offended,’ however I do care very much if anyone else was offended,” wrote Sorenson in her apology first reported by the Colorado Statesman’s Ernest Luning. “Please forgive me for being insensitive and not thinking of others in the heat of the moment.” The blogger she references is yours truly, and she actually factually told me, “I don’t care if people are offended.” (Listen to the recording here.) She did not say, as she claims in her apology, “I don’t care if you’re offended.” Of course, I take Sorenson at her word that she’s sorry she offended others, not just me. But she told me she didn’t care if people were offended, as in all people. What does Rep. Scott Tipton mean? He told the Colorado Statesman that there is no place for racism in the GOP. Does that mean he wants Sorenson to resign? Finally, Sorenson does not offer a full apology. Sorenson apologizes for her insensitivity, not for the sharing the meme. She doesn’t say she thinks it was a racist act, or that the meme was racist. Instead, she regrets that others view it that way. She wrote in her apology: “I apologize for my bad judgment.” And, “Please forgive me for being insensitive and not thinking of others in the heat of the moment.” This is in keeping with her original comment to me, that her post was a joke. In the wake of a meeting yesterday with Delta Country Republican Chair Linda Sorenson, who shared a Facebook meme comparing Obama to a Chimp, Colorado GOP Chairman Steve House promised racial-sensitivity training for party leaders, but he would not say whether Sorenson will resign, according to a story today by the Grand Junction Sentinel’s Charles Ashby. House said the situation has prompted a number of changes he plans to institute, not the least of which is to provide training on the difference between racism and being racially insensitive, adding that there is no room in the GOP for either. He also said the state party will provide training on how to handle social media, including on how to make things private. “Saying that you were wrong can come from two bases,” House said. “One is that you were willfully wrong, and the other is that you were ignorant and wrong. In this particular case it’s more ignorance than willful. So when you become racially insensitive, it needs to be used to educate. In addition to the Chimp meme, Sorenson shared or liked a handful of posts in the same vein last year. See them here. 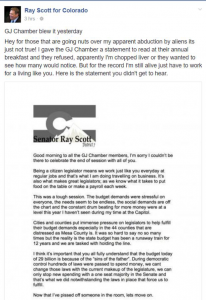 U.S. Rep. Scott Tipton (R-CO) told the Colorado Statesman through a spokesperson Friday that racism has “no place” in the GOP. But he did not call for Sorenson’s resignation. Neither did GOP U.S. Senate candidate Jack Graham, who also condemned the meme. Delta County Republicans will hold a public meeting at 7 p.m. tonight at the Surface Creek Community Church in Austin to discuss the issue–and other alleged lapses by Sorenson. UPDATE: In rsponse to news that Delta County GOP Chair Linda Sorenson shared a Facebook meme comparing Obama to a Chimpanzee, U.S. Rep. Scott Tipton (R-CO) told the Colorado Statesman through a spokesperson that racism has “no place” in the GOP. But he did ot call for Sorenson’s resignation. 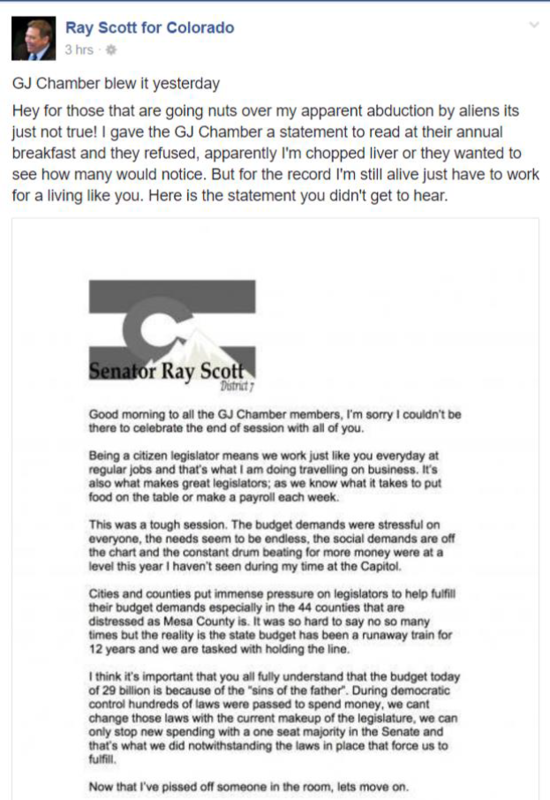 The Grand Junction Sentinel’s Charles Ashby reported today that not only is the NAACP calling for the resignation of Delta County Republican Chair Linda Sorenson but also Republican leaders themselves. 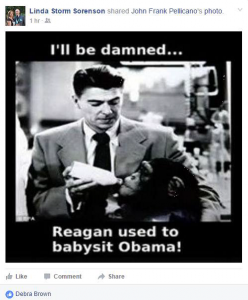 Delta Republican Matt Soper told Ashby that multiple GOP leades have called for Sorenson to resign 1) for sharing a Facebook meme comparing Obama to a Chimpanzee, as well as 2) for apparently endorsing U.S. Senate candidate Darryl Glenn. State and county rules forbid party office holders, like Sorenson, from endorsing a candidate in a primary election. Ashby reports that GOP Chair Steve House does “not believe [Sorenson] should have had that stuff on her Facebook page,” and House will be meeting with Sorenson and other Delta Country GOP officials on Monday to talk about it. House said the party is not a racist group, but added that there is a difference between racism and racial insensitivity. The location of the meeting, or whether it is public, was not disclosed. Still unknown is why Sorenson told me she posted the Chimp meme, but then Delta County vice chairman Vic Ullrey told the Sentinel that the meme was the work of a hacker. It appears Ullrey has not been asked directly about the contradiction. Multiple GOP sources have told me that Sorenson has also angered Republicans by her handling of the Congressional District 3 convention, allegedly bungling the vote counting and triggering complaints about the process, finances, and involvement of elected Republicans. The Sentinel did not report which Republican party leaders Soper claims have called on Sorenson to resign. Rep. Scott Tipton has not been quoted in media reports on the racist incident, which occurred in his district, nor has Sen. Cory Gardner, but Republican U.S. Senate candidate Jack Graham denounced the meme. In the article, Soper indicates that he personally saw Sorenson’s Facebook endorsement of Glenn. I don’t know of a case where a Republican or Democratic state official has resigned for endorsing a primary candidate, and some Republicans believe House himself signaled oppostion to Trump in speech to a GOP group last year. House denied that he supported the mogul over other candidates. Then Pueblo County GOP Chair Becky Mizel was apparently not asked to resign after essentially endorsing gubernatorial candidate Tom Tancredo in 2013. Back in 2011, in a similar action over party rules, then State GOP Chair Ryan Call suggested that then El Paso GOP Secretary Sarah Arnold should “strongly consider” resigning for criticizing elected Reublicans, in violation of party rules. …we’ve received several letters scolding us, in essence, for not sanitizing the news. While we’re not thrilled for being taken to task, it’s clear that people’s hearts are in the right place. Good people are offended by bigotry. Reporting the story required some sort of description of the offensive meme. A picture is worth a thousand words. Why not let readers see for themselves the unvarnished ugliness at the heart of the controversy? We’ve received a volume of calls. Some readers demanded an apology. Sadly, one caller thanked us on a misguided assumption that we were in agreement with the deplorable message…. Our feeling is that it’s a disservice to omit something so vile and disgusting because it robs readers of a complete picture of what’s going on in their community. Should the goal of writing about such a controversy be to soften the outrage due? If you’re outraged, you should be. But anger should be directed at the person who created the meme — not The Sentinel for pointing out that it appeared in the very public Facebook sphere for all the world to see. It would be one thing if the racism was posted by a nobody, but it came from the elected chair of the Delta County Republican Party. As such, she has enough of a “public” status to merit being held accountable by the Grand Junction Sentinel. And part of the process of public accountability, for the newspaper, is letting us know, within the broadest bounds of decency, what, exactly, she’s up to. You are currently browsing the archives for the Grand Junction Sentinel category.